It’s a good question, because there is a fundamental difference between Scrivener‘s outliner and an outliner like the outliner pages in Circus Ponies Notebook or of OmniOutliner. In Circus Ponies Notebook you can use one cell for one information unit (an idea, a quote, etc.). It is much more fine-grained. Like in Scrivener, you can fold (collapse) cells so that all subcells are hidden. 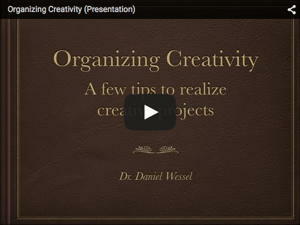 Very useful for a hierarchical structuring of information. 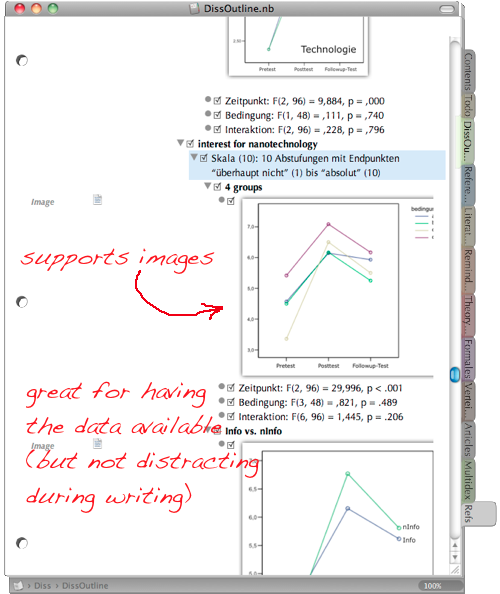 Circus Ponies Notebook also allows you to add images and summarize information in the parent cells (here for example the “interest for nanotechnology” cell which contains detailed information about the four groups, complete with an image of the ANOVA and the detailed statistical values). Great for summarizing what complex analysis say and seeing only the summary during the writing process. 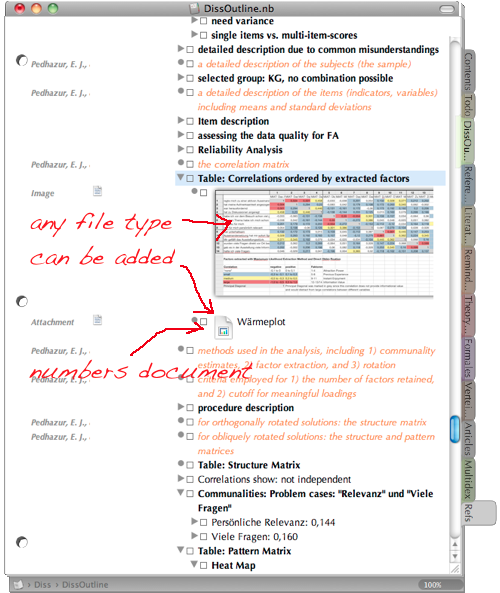 You can also add files, here for example and image and the Numbers document it is based on. Each cell can be tagged with the source information of the content of that cell. And — very important for academic writing — you can tag each cell with a keyword, which can be used to stick the source information to any quote or information you want to use in your article or thesis. In the image above for example one cell is tagged with “Hawkey, R. (2004)” and contains some information what I wanted to use from this source. The cells tagged with Borwoske (2005) contain direct quotes (italics). 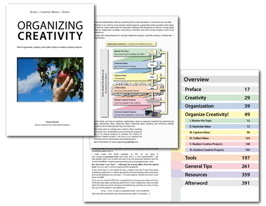 See Circus Ponies Notebook for Academic Writing (e.g., Thesis Writing) for more information. Of course the cells can be shifted around, copied and pasted, and if done correctly (simple copy and paste) the tags stay attached to the cell. Very, very useful. 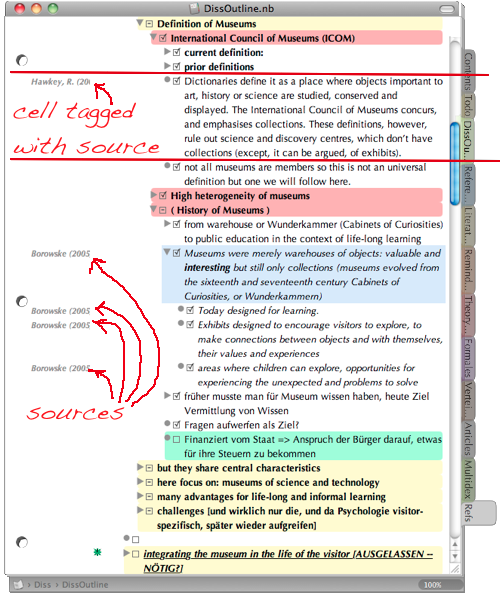 You can also collect information in a dedicated notebook and copy and paste the cells in a new notebook, in which you put what you need for writing the article. And given that you can add a checkbox to each cell you can always stop and resume writing and know where you stopped. I strongly recommend using meta information, for example what should be in a section or what should be clear after reading a section, in the outline. 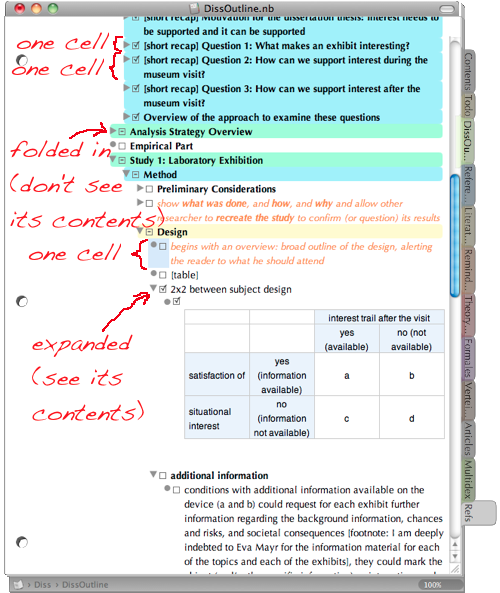 If you look at the first Circus Ponies Notebook image in this posting, you see orange text as a child cell under the Method section parent cell (“show what was done …”) and likewise as a child cell under the Design parent cell (“begins with an overview …”). Sometimes it is hard to remember during writing what a section is supposed to accomplish and this meta information (in another color and with checkboxes) is a tremendous help. 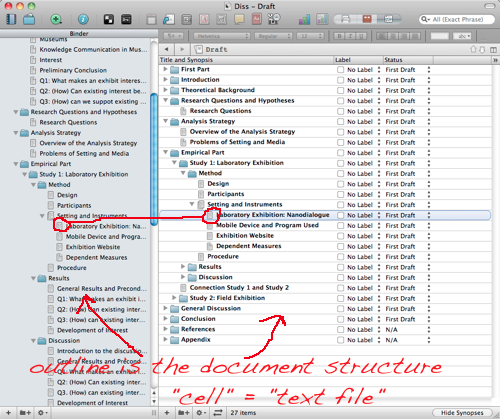 So, in Scrivener one outline “cell” is actually a text file — it is a structure outline. Very good to get an overview of the document, see which “sections” need work (e.g., status as First Draft, Word Count). But even if you display the content of this cell in the outline view, a single “cell” (= line) usually contains more than one idea, which makes it very hard to change the structure as sentences tend to stick together. Thus, it is very useful for higher order structuring like part, chapter, subchapter, even on a paragraph level. But you probably wouldn’t want to use it on an argument/idea/information unit level. Personally I went so far to use separate files for subsections, but not for paragraphs, i.e., one subsection (like the “Design” section below) contains multiple paragraphs and ideas. 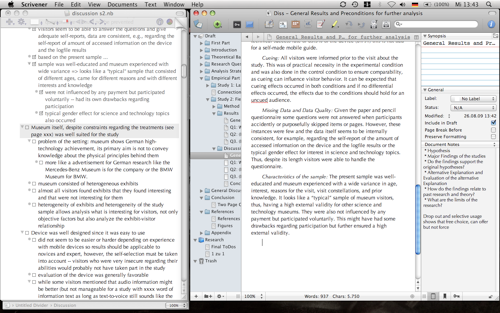 A “cell” = text file in Scrivener contains more than one idea … here, multiple paragraphs. In Circus Ponies Notebook one cell contains one unit of information/one idea/argument. If I have taken it from another source, the source information is tagged to that cell (assigned as keyword, which can be views with cmd + k). This kind of content outline is made to have its cells reordered, folded in, shifted around. I change and simplify the structure during the planing phase when I put information in this content outline by summarizing subcells in their parent cells (e.g., multiple sources say the same, the parent cell thus contains a summary). When writing I can use the summary or go into the details, depending on how much space I have during writing. Circus Ponies Notebook (left) next to Scrivener (right) — a very good combination. 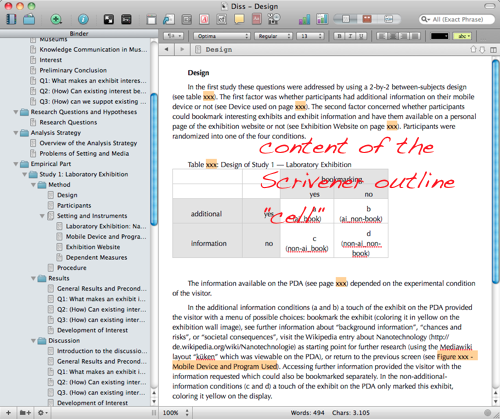 In practice, both types of outlines combine perfectly, and although in almost every case, a content outline is also a structure outline, it is helpful to use Scrivener and the Structure Outline for writing. I start with Circus Ponies Notebook to create the content outline, make sure I have all information available in it and the structure works (thread/story). Then I fire up Scrivener, use the Binder to create a structure outline (on a higher level, see image), put the Circus Ponies Notebook content outline next to the Scrivener file and start writing. Circus Ponies Notebook excels when it comes to keeping the content available, giving me the source information (keywords), allowing me to fold in information that I do not need (e.g., level of detail is too high), and having cells with checkboxes, which allows me to easily stop and resume my work. Scrivener excels in writing, especially making Snapshots of prior versions, giving me word counts, and quickly jumping between places in the document (via the Binder of Scrivener which only contains the higher level structure and the text files). next older posting: What do you live for?